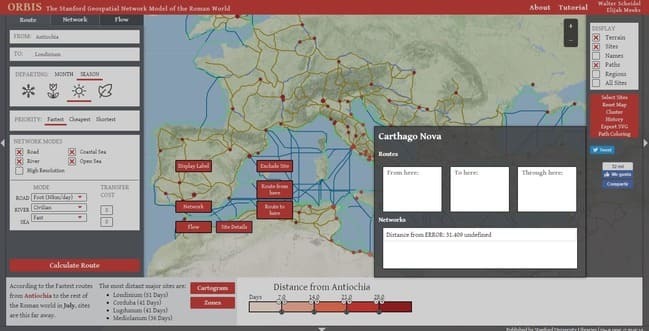 Stanford University has a calculator of sea and land routes, which existed in the Roman Empire. ( ORBIS) . 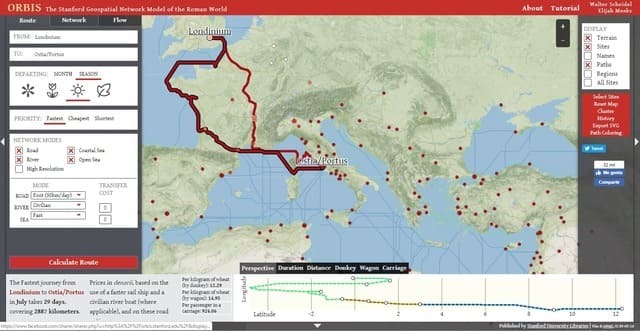 The calculator has land routes, maritime coast and offshore, used during the Empire. 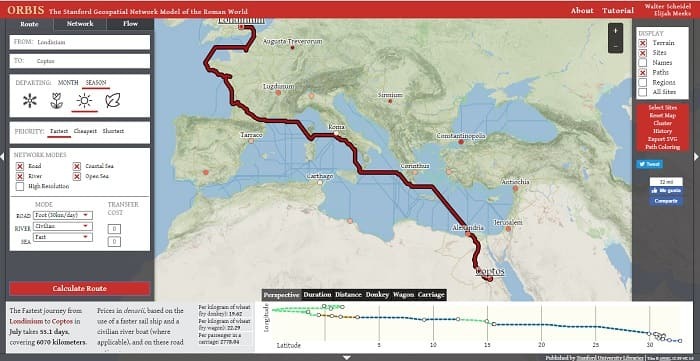 Long route ( Road & River) from Londinium (London) to Coptos in Egypt: The fastest trip from Londinium to Coptos in July takes 55.1 days, covering 6070 kilometers. 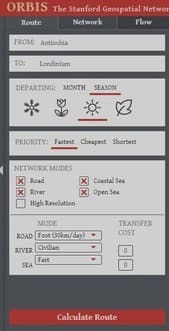 Travel in Summer. 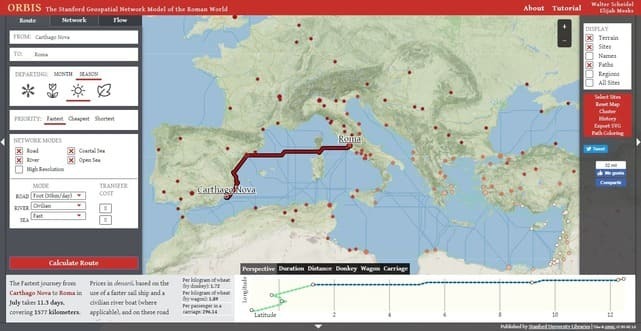 Cartago Nova ( Cartagena – Spain) to Rome in July takes 11.3 days, covering 1.577 kilometers. Travel in Summer. 29 days, 2.897 km, in summer. 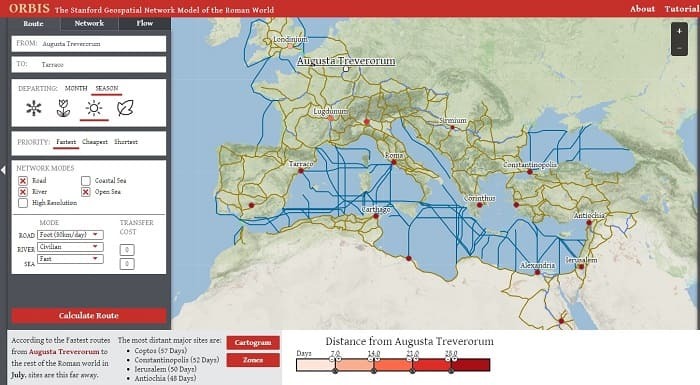 The Roman road was the road model used by Rome for the construction of its Empire. The road network was used by the army in the conquest of territories. Large forces could be mobilized with a speed never seen before. He played a fundamental role in the economy because the transport of goods was significantly improved. The roads also had great influence in the diffusion of the new culture and in spreading the Romanization throughout the Empire. 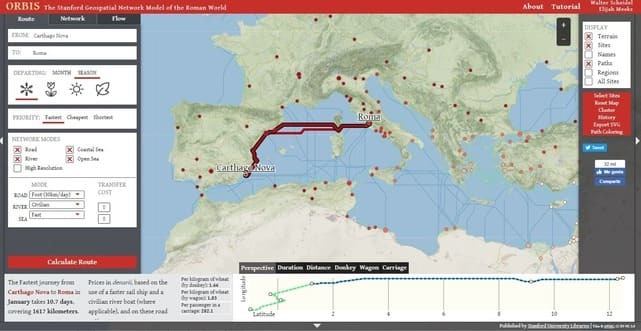 The Itinerary of Antonino, of the 3rd century, is the written source that gives us more information about the Roman road network. 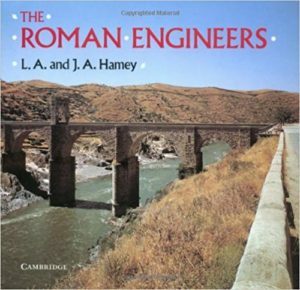 The Roman Empire invested a lot of time, effort and money developing new cranes for the construction of their buildings, bridges and especially aqueducts. They took the Greek’s crane as a model and improved it. In fact, the simplest Roman crane was the Tripastos. 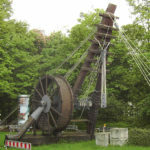 It consisted of a single beam jib, a lathe, a rope, and a block containing three pulleys. By maintaining a multiplication ratio of 3 to 1, a single crane operator could raise 300 lbs. A more advanced type of crane was the Pentaspastos which had five pulleys. Moreover and even more sophisticated than the Pentaspastos, was the Polyspastos, which had 15 pulleys and up to four masts with a ratio of 60 to 1. The Polyspastos, indeed, had four operators per side of the lathe, and it could have a maximum load lifting capacity of 6000 pounds accounting for the maximal effort per operator of 100 pounds each. In case the winch was replaced by a drum, it would double its capacity to 12000 lbs. However some buildings contained stone’s blocks of more than 100,000 lbs. How could they lift these loads more than 30 yards high? The Roman engineers managed to raise these weights using a diversity of winches. 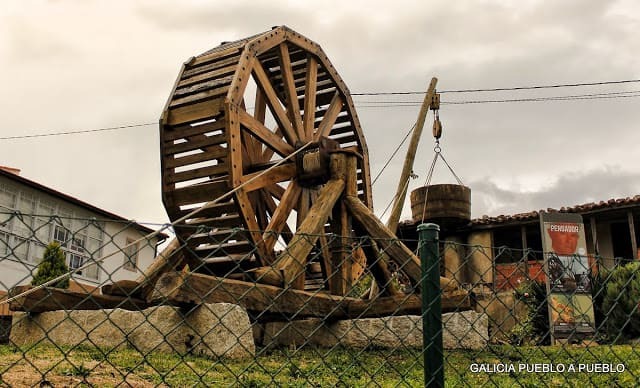 Although winches have a lower multiplication factor of forces than those driven by drums, Romans could have installed more quantity of winches operated by men or even animals. This kind operation a great coordination was required between the working groups that operated the capstans. The cranes were almost always operated by slaves who were designed for these industrial jobs. In fact, they were assigned in the so-called squads which had a technical head, the praepositus. 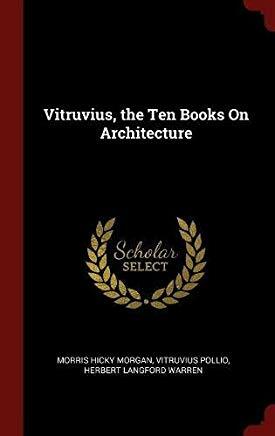 Marco Vitruvio was the author of a book, known today as The Ten Books of Architecture, a treatise written in Latin and ancient Greek about Architecture. It was dedicated to the Emperor Augustus. In this book he describes different types machines such as forklifts, cranes and pulleys used for engineering structures. It also contained descriptions of war machines like catapults, crossbows and siege machines. 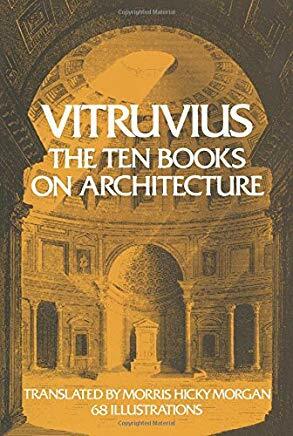 As he was an engineer, Vitruvio was not only doing a description of the machines itself but he might probably have built and tested them. How Many People will Travel the World in 2019? By 2019, the UNWTO expects that the growth of international tourists will be between 3% and 4%, compared to 2018: More in line with historical growth trends. The most visited countries in 2018 were France, Spain, the United States, Italy, China and Mexico. Overall, the growth of 2018 was led by the growth of the Middle East (+ 10%). Africa (+ 7%). Asia-Pacific and Europe (both with 6% more). Arrivals in the Americas were below the world average (+ 3%). Leer másHow Many People will Travel the World in 2019? Saint Moritz (Sank Moritz) , located in the south-east of Switzerland, in the region known as Upper Engadine ,. 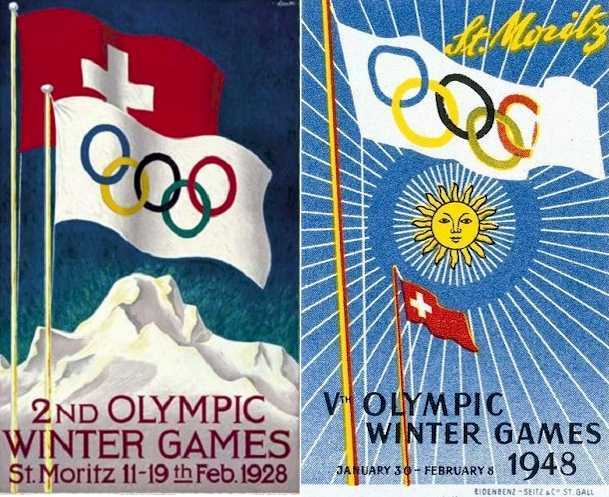 The site is known worldwide for the celebration here of two winter games: 1928 and 1948. 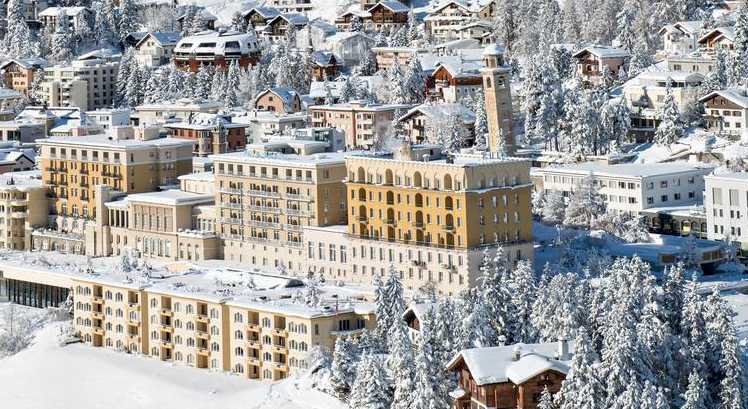 Sankt Moritz (St. Moritz) was mentioned for the first time in the 12th century. It was a village that was formed around springs, which according to beliefs of the time had healing powers. 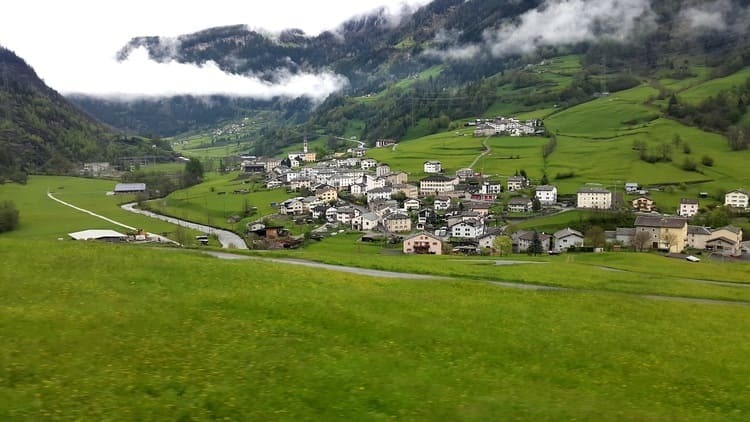 The village is named after Saint Maurice, who according to legend was a martyred Christian in Roman Switzerland. 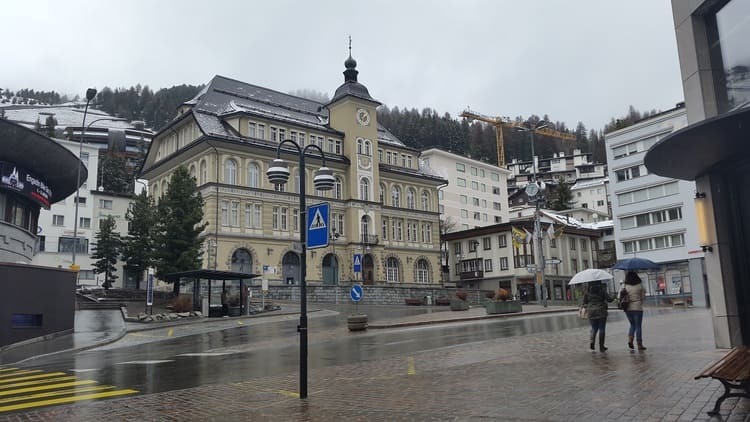 Caspar Badrutt, born in Samedan in 1819, emigrated as a child to Saint Moritz with his family and in 1858 he founded a hotel, antecedent of the current Hotel Kulm. 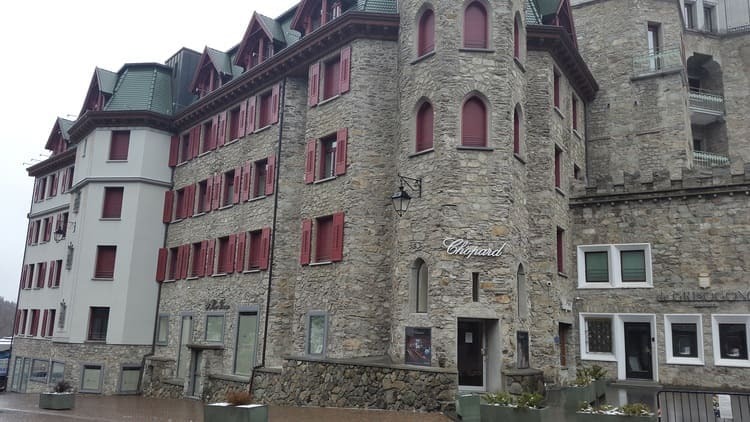 In 1864 according to oral legends, he invited a group of Englishmen to his hotel with the condition that if they did not enjoy it, I would reimburse them for travel expenses. The visitors arrived and stayed more than six months. In summer the Saint Moritz lake is full of water and sports activities. The lake it freezes and is also the scene of recreational activities. In 1907 a horse race was run on the frozen lake. They also practice other sports on ice such as polo (on the frozen lake), cricket, hockey and cross-country skiing. 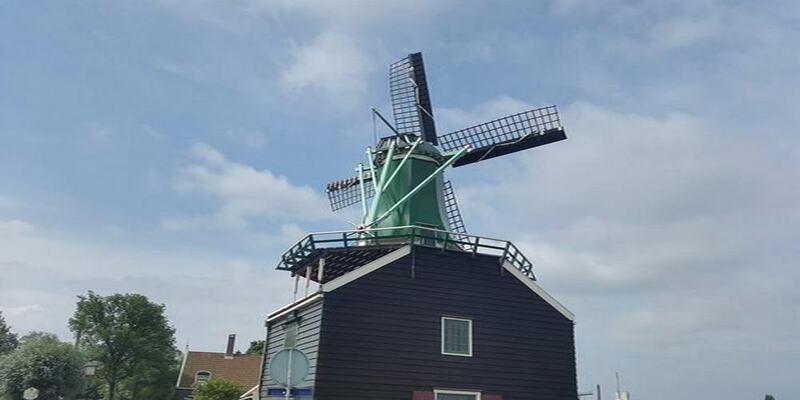 You can visit the town on foot in two hours. We start with Via Maistra, pedestrian in its first part. In this street there is a leaning tower that dates from 1570, although it is only 12 feet high and a slope of about four degrees. It was part of the old church of San Mauricio, destroyed in 1890. In the surroundings there are still some tombs. Nearby is the monument to the “crest corridor”, the local sport. It is practiced on a natural snow track that has its starting point where this bronze image is located. The event is held annually every winter since 1885. Walking along the Via del Bagn you reach the Engadiner Museum, which allows you to get to know the life of the city in different periods. It is approximately one hour of travel. Price 20 dollars (13 Swiss Francs) and children under 16 years are free. Tuesday closed. 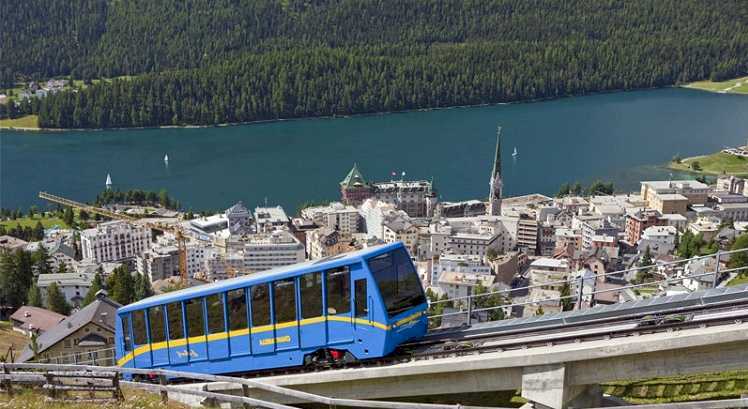 On the way to the mountain you can use the funicular railway linking Saint Moritz with the Corviglia ski center. The price is about US $ 60 per person per day. The snow pits of Corviglia are considered one of the most important in Europe. It has options for all levels including children. 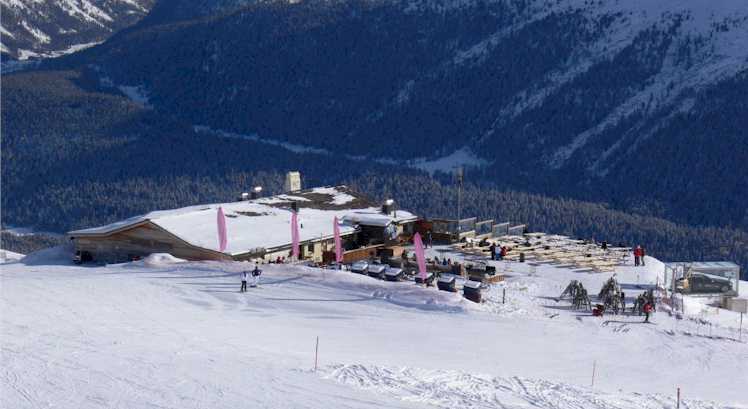 The Alpina Hütte center, close to the funicular station, closes from April to June. On the way back, at the Chantarella transfer station, there is one last attraction. Half a mile away from the station is Heidi’s cabin. Here the film of this child character was filmed. Access is free and the walk to the place does not take more than 30 minutes. Another way to enjoy the meadows, snow and mountains in Saint Moritz: Next to the lake Saint Moritz is the railway station. There is the terminal of two panoramic trains. Glacier Express and Bernina Express. Today we are going to talk about the latter because it is what we take to get to sank motitz. We did it from the station of Tirano (Italy). After a journey of more than two hours through amazing landscapes, precipices, tunnels, bridges, lakes and snow, you will reach Saint Moritz. It is advisable to do it as much as if you are passing through or hiking. here the pictures of the train trip.